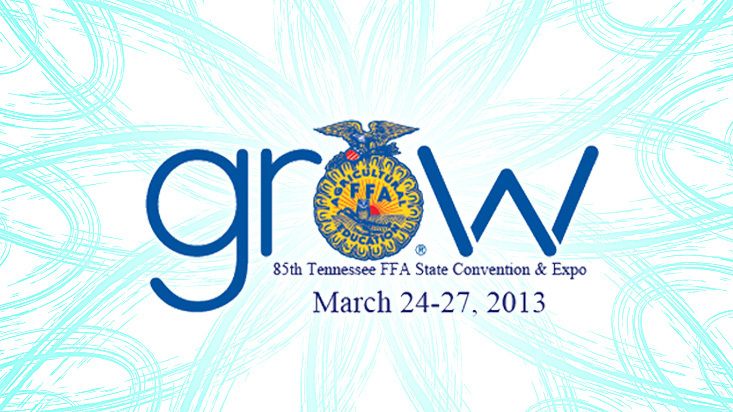 View the 2012-2013 David Crockett FFA CDE Placings here! CLICK HERE TO WATCH ANY OF THE 7 GENERAL SESSIONS! TN State FFA Officer Candidate- Rebekah Wright - Elected State Officer! OUR NEWLY ELECTED TENNESSEE STATE FFA OFFICER! a high-water mark on the Pinnacle of FFA Success! After a grueling 2-day interview and activity process, Rebekah was elected to serve as one of the 3 State FFA Vice-Presidents. She is only the 4th David Crockett FFA member to ever be elected as a State FFA Officer, a rare achievement indeed. Rebekah will serve her 1-year appointment traveling the state, attending speaking engagements, visiting FFA chapters, and representing TN FFA in various functions. Click here to read more about Rebekah and the State FFA Officer Team and to see their 1st interview. GREAT JOB FFA MEMBERS - OVER 900 BOXES OF FRUIT SOLD TO OUR COMMUNITY! NATIONAL FFA GOLD EMBLEM - 11TH PLACE IN THE NATION! Bryce Bateman, Kareena Jones, Jonathan Lykins, and Rebekah Wright of the David Crockett FFA Chapter represented Tennessee in the 2012 National FFA Nursery and Landscaping CDE during the National FFA Convention in Indianapolis, IN on Oct 24-25, 2012. The team placed 11th in the National Contest out of 39 states. Bryce Bateman placed 19th High Individual. They received a Gold Emblem award, which is awarded to the top tier teams. Out of 21 National Contests held at the convention, only 6 Tennessee teams won Gold. An 11th place finish in the Nation is a remarkable feat! The contest consisted of plant identification, landscape estimating, general knowledge exam, propagation, a written exercise, a verbal exercise, a team presentation, and a team skills challenge. The contest was completed during a mentally and physically grilling 2 days as they competed against teams from California to Florida. As always, they represented the state well in courtesy, attitude, and character. They have gained upmost respect from fellow chapter members as well as other members from across the state and nation. Chase Partin placed 5th in the 2012 National FFA Agriscience Fair, winning Gold Emblem! The Fair was held during the 85th National FFA Convention in Indianapolis. Chase competed against state-winning FFA members from across the nation. The process included an application explaining his research, a written research paper, a log book, a display of the research, and an interview with collegiate-level judges. He made new discoveries in the research. The judges enjoyed their interview with Chase; their interview turned into a conversation. Chase's experience was extremely rewarding. He met and made friends with competitors, getting to know their different backgrounds, yet all being connected through FFA. Chase added, "It doesn't seem like you are competing against each other. It seems like you are competing with each other." 5th place in the Nation is a job well done! Chase qualified by winning the State Agriscience Fair this spring and was one of 15 National Finalists chosen (up to one applicant from each state). CONGRATULATIONS TO COMPETITORS IN THE FFA SPEAKING CONTESTS! Bethany McCurry, and Chase Partin. Other members competing were: Abby Anderson, Kenzie Bastian, Aaron Ford, Ben Ford, Kayla Jones, Tiffany McGee, Makay Rowenhorst, Raini Rowenhorst, Taylor Stout, and Cole Tipton.